The needs in India are almost unlimited, and what we can do is limited only by our funds. But we try to help people in need in all sorts of ways. There is a saying that if you give someone a fish, you feed them for a day; but teach them to fish, then they are fed for life. However, often what they need is not teaching but a fishing-rod. Sulorjena was trapped in an abusive marriage, unable to help herself. 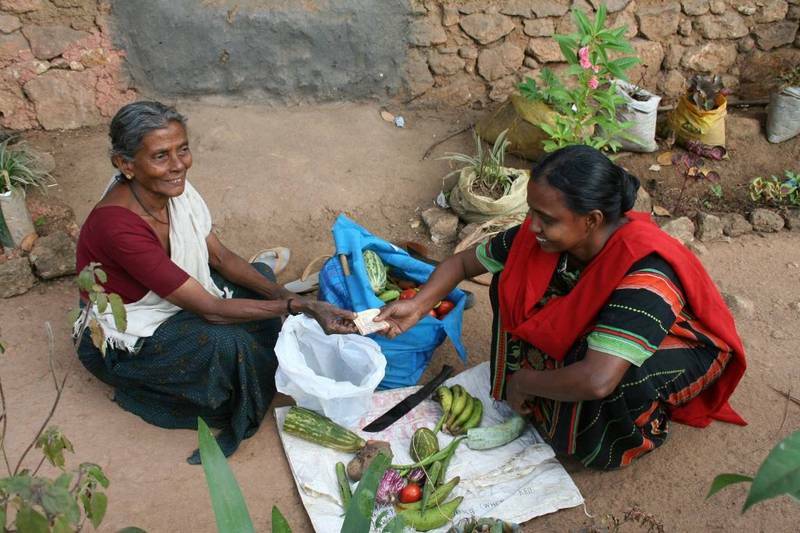 A grant of 1,000 Rupees (about £14) was enough to set her up in business: it enabled her to buy fruit and vegetables from a wholesaler, which she then sells in the local market and then from door to door in her village. She made about £1 a day – not a lot, but enough to live on in India where the cost of living is much lower than in the UK, and it gave her the independence and dignity that was denied her before. It also took the stress out of her marriage - her husband stopped drinking and maltreating her, and has actually become a nice person! Numerous other people have been helped to set up in business – a small shop or other retailing, or an autorickshaw are the most popular. 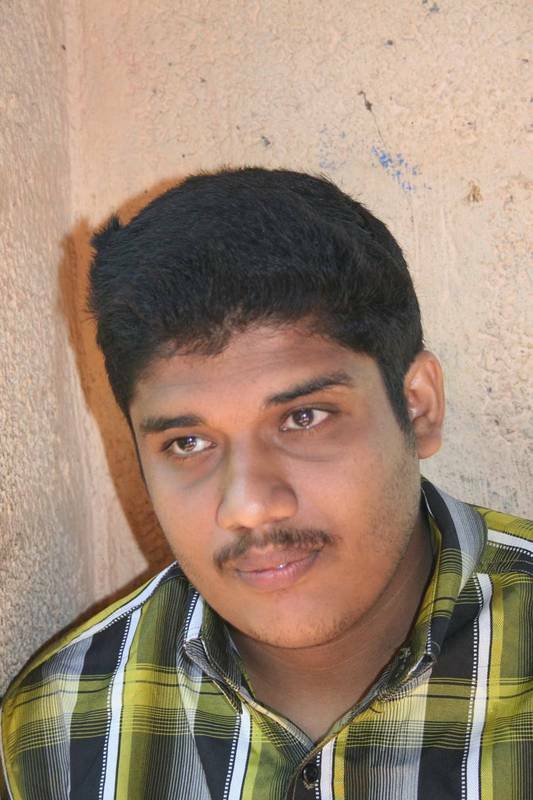 Shiva Prassad is a blind young man. There is a good centre for the blind run by the government in Thiruvananthapuram, but his family were too poor to be able to afford the bus fare to get there. HHI provides 500 Rupees (about £5) a month, which covers the bus fare and enables him to get the training that he needs to empower him support himself. A goat provided by HHI, with her kid. If a family has nothing, it will often remain in poverty. But a goat, some chickens or a cow can make a huge difference. Goats are particularly popular; they will eat almost anything, including the scrub that exists underneath the trees of rubber plantations; the females produce milk that is nutritious or can be sold, whilst the young can be sold, or reared for meat, or kept to build up a sizeable flock over a few years. 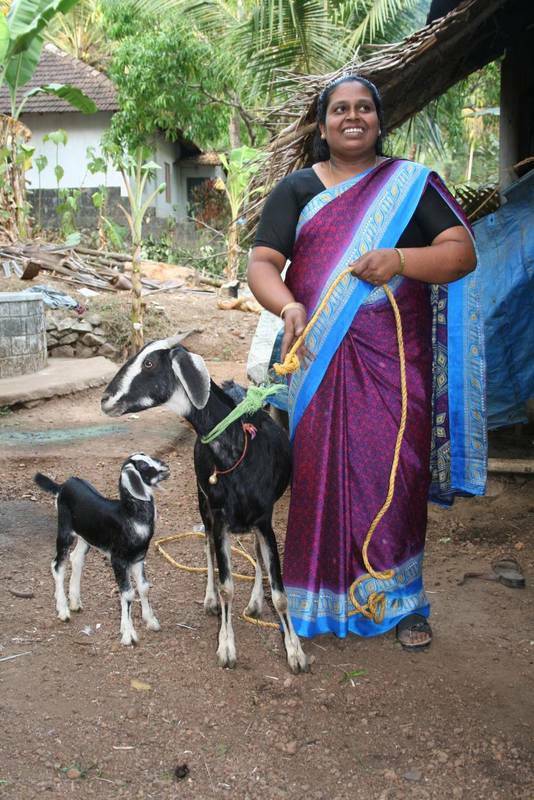 For an impoverished family, a goat can make all the difference between destitution and getting by. 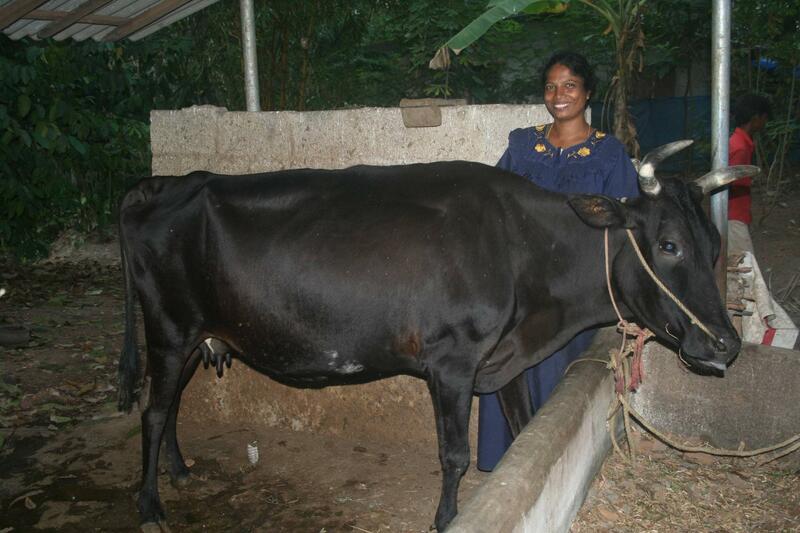 One such person is Sanda Ahilla, the recipient of a HHI cow. Her husband is unwell, and is only able to work occasionally as a labourer, and as a result the family were dependent on handouts and could not afford to keep their son in school. A cow made all the difference a few years ago: it provides 7 litres of milk a day which they s for Rs. 25/- (40p) a litre, enough to support the family and pay for her daughter at nursing college as well as enabling her son to return to school. She finds fodder in verges and fields, and buys cattle feed. The cow is insured, so that if it falls ill or dies the family will not suffer. 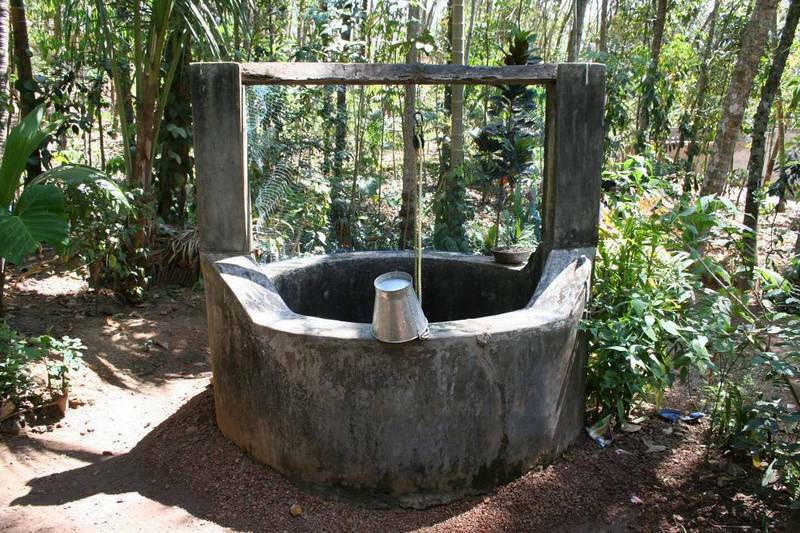 Wells are a vital source of good clean water, and the cost of a well will often be subsidised by the government, but many people cannot afford even the subsidised cost. Providing wells has been part of HHI’s mission for many years; a well will provide healthy water for the lifetime of a family. We have also helped with the University fees for nursing students. Getting a well-paid job is the route out of poverty, and often the entire family benefits, not just the student. It also ensures that hospitals have the staff that they need. It is all part of helping Indians to help themselves to better health and life. Debt is a perennial problem in India. Interest rates are high – typically 12-15% on a bank loan. Loan sharks prey on the poorest people who cannot get bank loans, charging 10% a month. Such loans mount up very quickly, and the lenders can be ruthless in reclaiming the loan. Many people have committed suicide as a result. HHI has been piloting a scheme, whereby people are helped to pay off their loans, so helping them to extract themselves from dependence and poverty. We have helped other people in all sorts of ways too numerous to mention. Being a small charity, we are able to review each application on its merits, and to satisfy ourselves that the applicant has sufficient skills and abilities to benefit from the help that they are asking for. Inevitably, some fail; but others have provided a significant income for people and their families over many years. If people do not have the skills that they need, we have helped them with training. 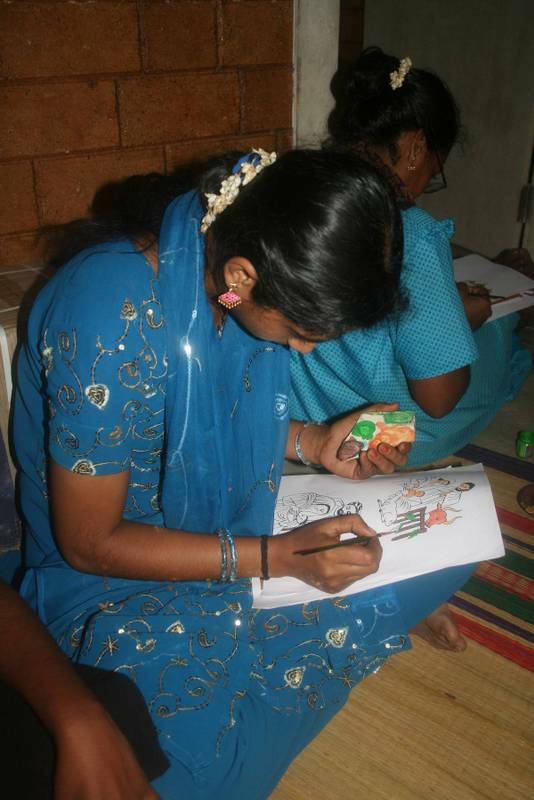 One such training project is to develop painting skills. Those who show some aptitude in this area can use them in leaf painting. This is a traditional Indian pastime which Tom has developed and made more accessible to those of modest ability. The results are stunning, however. We incorporate painted leaves into Christmas, St David’s Day and other cards, and more recently we have started selling painted leaves showing scenes around Strathaven (our founder’s birthplace) in a framed set – this has proved very popular.